Our Financial Advisor Sales Letters have only one goal… and it’s NOT to sell financial products. It’s to make people CALL YOU! Our Financial Advisors sales letters are very different from the sales letters you see anywhere else. Our sales letters are smooth, well tailored and highly responsive letters. Professionally written, yet have a very personal feel. These letters look like they came right from you – hand typed, and right out of your printer. Unlike prospecting letters from other writers – or your providers – they don’t sell anything. Crazy, right? These letters are written to one specific goal: to make people call you. Our letters make that introduction. We talk a lot about our Financial Advisor Prospecting Letters, but action speaks louder than words. We thought you’d like to see a FREE Sample Sales Letter of one of Dobkin’s actual Financial Advisor Sales Letters. Enjoy a preview of this SAMPLE BUSINESS LETTER – a business sales letter template you receive when you buy our Awesome Financial Advisor Sales Letter Series. You can see exactly why our letters are so different from anything else on the internet. This entire series of sales letters is written specifically for Financial Advisors. Each customer prospecting letter is written to fulfill only one goal: to have readers CALL YOU. Our senior writer, Jeffrey Dobkin is a direct response specialist. Dobkin has written 5 books on successful direct marketing methods, and has been writing direct mail letters for clients for more than 20 years. He knows a thing or two about writing highly responsive letters; and definitely knows how to make your phone ring. Some of his direct mail letters have been mailed to millions of people. Over 100,000,000 sheets of paper that have been written by him have been mailed worldwide. Chances are you’ve already seen a lot of his work in your mailbox. What would a Financial Advisor business letter series like this be worth to you? The Danielle Adams Publishing Company offers a series of 12 hard working financial advisor sales letters, written to fulfill only ONE OBJECTIVE: to get the maximum number of people to call you. Our series of financial sales and prospecting letters was written for maximum response to make your phone ring. These letters are written and designed and completely to mail… right from your own computer. They’re lead generation letters at their significant best! Mail to old clients to reconnect and they’ll call you as well! Mail to your top-tier prospect list for great client acquisition campaign. Mail to your TOP potential client list to generate calls. Our sales letters don’t actually sell financial products. Each letter’s goal is not to sell financial products – that’s your job. People don’t receive a letter and buy a financial product – they can’t. There are no prices, no quotes, nor an order form. Readers couldn’t purchase a financial product from your sales letters even if they wanted to. They need to speak with someone. They need to call to inquire or buy anything. Each prospecting letter you receive from us in our sales letter series asks prospects and potential clients to call you. All our sales letters are written to give YOU have the opportunity to talk to a warm prospect. Isn’t that what you need? You don’t need a product sale, you need a client. You need a warm prospect to call you. Bonus – since these letters are not selling any specific financial products, no problems with compliance… or from your providers or parent company. · Allows YOU the opportunity to speak with prospects: set appointments, or sell financial, investment and insurance portfolios. · Easily get names and addresses of warm prospects. · Forget cold calling! What stress and burnout. Mail letters and have people call you. We believe people don’t buy financial products from a letter. We believe people buy financial products from a person. Each letter in our financial advisor sales letter series gives you that introduction. It gives you the opportunity to present financial products options to the people that call you. We think you’ll see why our letters are so different — Free Business Letter Sample: Financial Sales Letter. Yes, we’ve heard our letters are expensive. Let me ask you: What’s the value of a new customer to you? We believe copywriting is expensive only if it doesn’t work. How much do you think you should pay for one of the highest ranking direct marketing copywriters in the country to write over a dozen highly responsive direct mail letters? Keep in mind he’s written each letter specifically to make your phone ring. 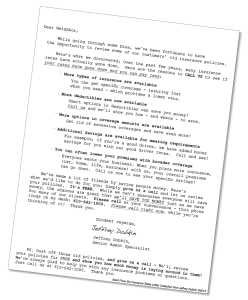 The direct mail sales letters we offer were 30 years in the making. Even with Dobkin’s expertise, each letter still took over 12 hours to research, write, edit and design. Each letter is still cheaper than a tank of gas, or last night’s dinner. Certainly less than one car payment. While your car may be great, it doesn’t introduce you to new clients on the phone, which is the goal of each of our sales letters. Isn’t that actually how you got to buy your car? Clients. 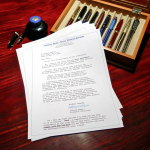 Another consideration we had in pricing our business letter series: Exclusivity. We put a premium value on our own clients. We feel it would be very embarrassing if any of their top clients received the same letter from several financial advisors. So instead of selling 100’s of sets at $14.95 for each set of letters, we keep them close at hand and exclusive to our own small group of clients. Exclusivity means greater value to our own customers, but comes at a cost. If these letters make your phone ring just once, is it fair to say they’ve paid for themselves many, many times over. If you mail a lot, I’m sure Dobkin would be happy to work on commission – but I can assure you that our unlimited-use sale price is much, much cheaper. If just one person calls and becomes a client, what would that be worth to you? That’s the real value you receive in purchasing this business letter template series. If you want your phone to ring with warm clients who are ready to talk – then please order this serious series of business letters. Send these direct-selling letters to your present and past customers, prospects, and top potential clients: anyone you’d like to have call you. Letters are written specifically to make your phone ring. Each sales letter is strong enough to stand alone — and get your phone to ring. Or as a full campaign to your top tier prospects: mail a letter every month as part of a series to keep your firm in the front of each customer’s mind over the next 12 months. First, if you have any questions please call Jeffrey personally: this phone rings on his desk: 610-642-1000. We may market on the internet, but we’re real people and your call is always welcome: 610-642-1000. Questions, comments – always welcome. Jeffrey Dobkin, and the Danielle Adams Publishing editorial team. Order on-line: Our financial advisor direct-response letters are sent to you via instant download. Your license is for unlimited use in your own personal mailings, or an office of up to ten people Please call for licensing rights for larger offices. All letters are professionally written and elegantly designed – ready for immediate mailing. Sent to you in Microsoft Word so you can add your letterhead right into the file, print on your letterhead, make changes to the letter easily, or format for mail-merge personalized mailings. You can also take to a quick copy shop or printer. Available in Apple Pages as well – just ask. Letters are complete: When we say written and designed, we don’t just send you raw copy and say good luck. Every paragraph – and paragraph break – is designed with a singular objective: to increase caller response. Every line break doesn’t happen by chance, it’s put there on purpose – to direct the eye flow of the reader to the phone number… and make the reader pick up the phone and call. Bold, italic, underscoring – indented paragraphs just like this one – all add to the impeccable design and the professional appearance of these business letter templates; and to increase response. Every space, every dash – everything in these letters is done to increase phone call response. Please feel free to use all 15 letters, or just pick a few of your favorites and mail. Mail to old clients to revive them. Mail new prospects to have them call you with questions or for more information. And mail these sales letters to your TOP PROSPECTS and stay close to the phone – we think you’ll want to be there when they call. If you need help with how to best accomplish your mailing, please call us – we are always happy to help. Wouldn’t it be great to have new clients and prospects CALL YOU for a change? It can happen when you order our incredible sales letters. Written for one purpose. Yes, and by now we think you know what that is. And that objective – to generate a “HELLO” – is what separates our letters from every other sales letter you can purchase. They sell products. Our letters sell getting your phone to ring. We sell response. Order these direct mail sales letters and see what your mailings have been missing: a great response. Market to a WARM market, instead of wasting your time cold calling. Letters are downloaded instantly and ready for your immediate use. Thank you for your consideration to purchase our letters. Questions? Comments? We always welcome your phone call: 610-642-1000. The best way to get new business is a referral. Order now and get this special time tested letter: “Thank you for your referral!” that drives new business your way, while showing that you really appreciate your original customer. And guess what? Use this special letter to thank customers when you receive a referral from them and they are always happy to refer even more new customers to you. It starts by sending them this well-crafted letter of thanks. FREE with your order of our Amazing Financial Sales Letters. To view our Financial Advisor Business Letter Sample please click on this link. Marketing through testimonials is one of the most effective ways to get new clients. This white paper shows you a way to get more testimonials – and includes the most-powerful way to handle getting great testimonials. There is tremendous value in these two free gifts. Call now and order these Financial Advisor Sales Letters and get these powerful client builders, FREE with the purchase of our full set of Financial Advisor Sales Letters. Thanks. Questions? We are real people and we are always happy to help: 610-642-1000. This phone rings on Jeffrey Dobkin’s desk. Just because we sell over the web doesn’t mean we don’t care about every customer, every day. Your phone call is definitely welcome: 610-642-1000. 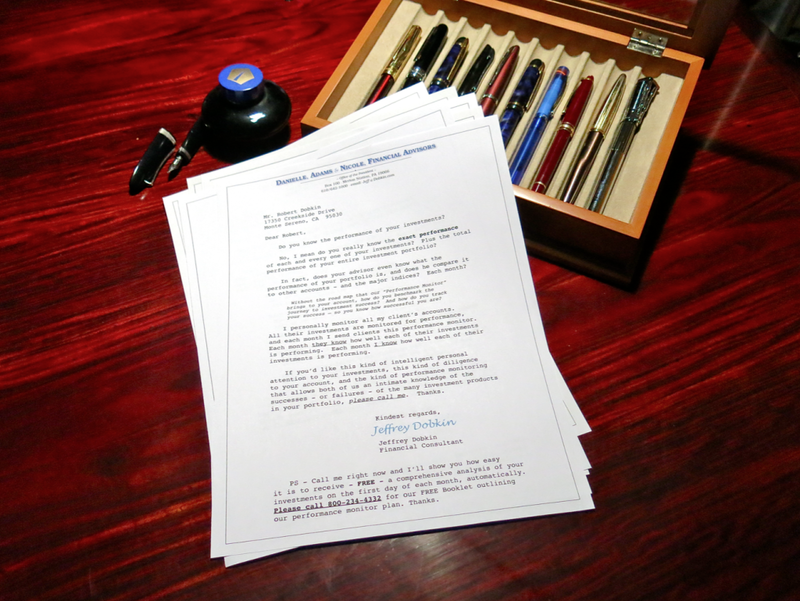 Need a custom sales letter written just for you, your firm? Please call. While we enjoy brisk sales of our pre-written letters, our real day job is writing letters for clients. We write letters for any industry because… just like these financial letters: we don’t have to sell your products, we just have to make people call you. We think that’s a lot easier! Lots of samples on this website. Our ideas are usually unusually good, and it’s free to talk: 610-642-1000. We also do some pretty great – and effective – market consulting. Call and inquire. Thanks. Full advertising agency services available! Heavily experienced – our 25th year, and we still enjoy every day!